What a great day for the Fourth of July parade in Pleasant Valley. The Star Band sounded great as always. Both kids and adults had a great time and it seems as if the whole community was involved. 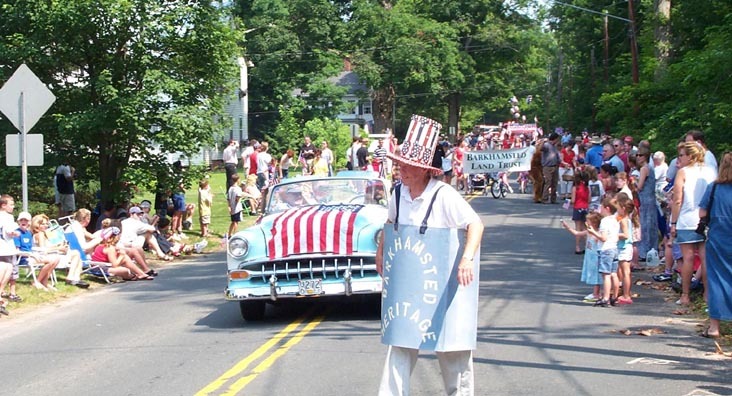 This year (2003) the parade had added significance for the Historical Society. 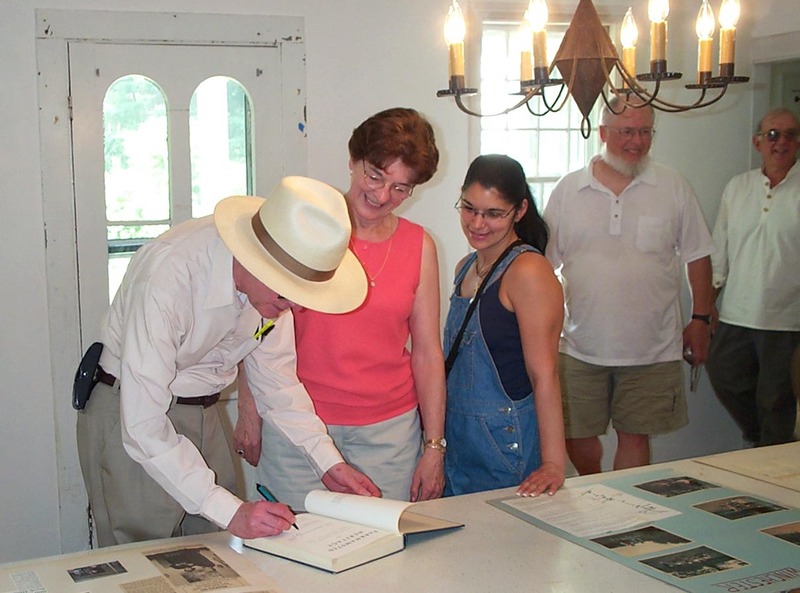 Besides participating in the parade, we welcomed friends visiting for the event, including George Hilton, co-editor of the Barkhamsted Heritage. The Barkhamsted Heritage, a town history published in 1976, was a big project organized by George Hilton and Richard Wheeler. Richard died shortly after the book was published but we were joined by his son Bruce. At the conclusion of the parade George and Bruce signed Heritage books at a Squire's Tavern open house event. 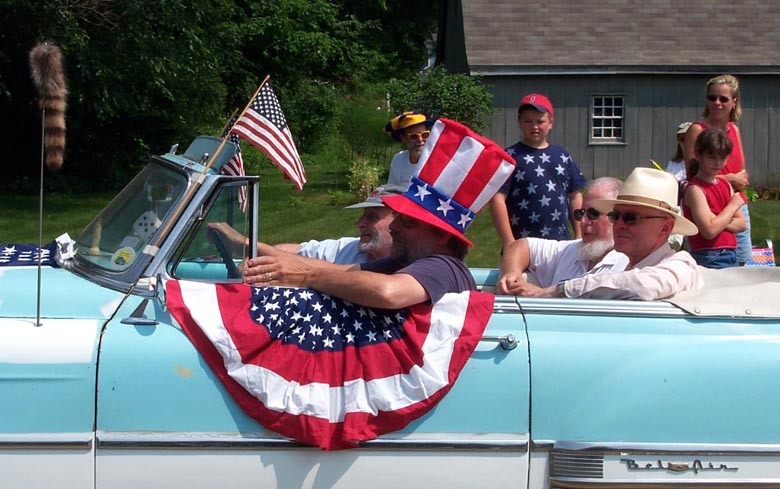 Left to right- Jim Fenn, Bruce Wheeler, George Hilton and Fred Warner at the conclusion of the 2003 July 4th parade at Pleasant Valley. 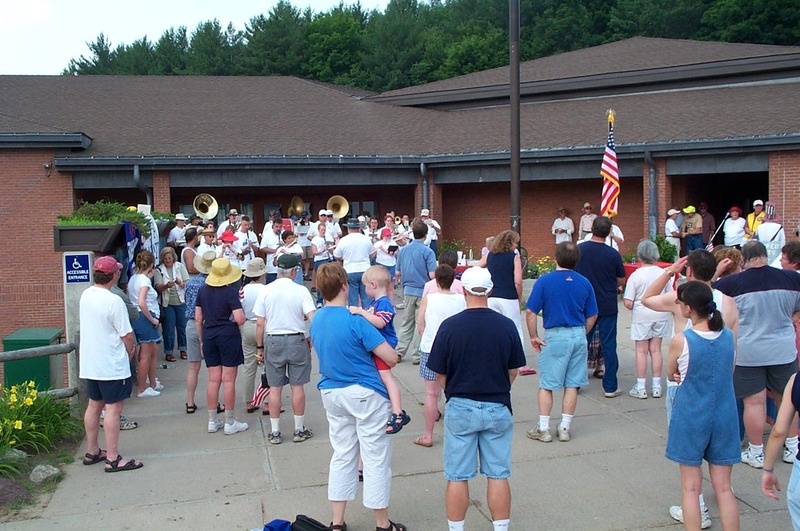 Below: photos of the 2003 July 4th parade at Pleasant Valley. It was a nice hot day! July 4th, 2003 parade in Pleasant Valley- and the Historical Society is taking part along with many other town organizations and citizens. 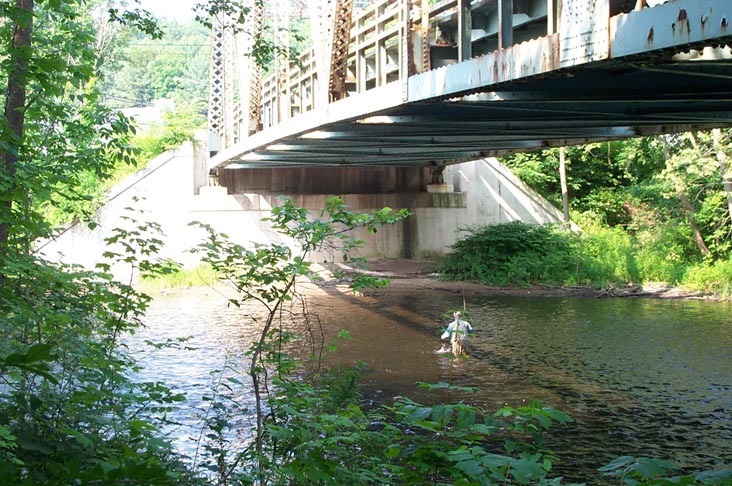 On this hot day, Karen and Noreen are happy to hit this shady spot on West River Road. 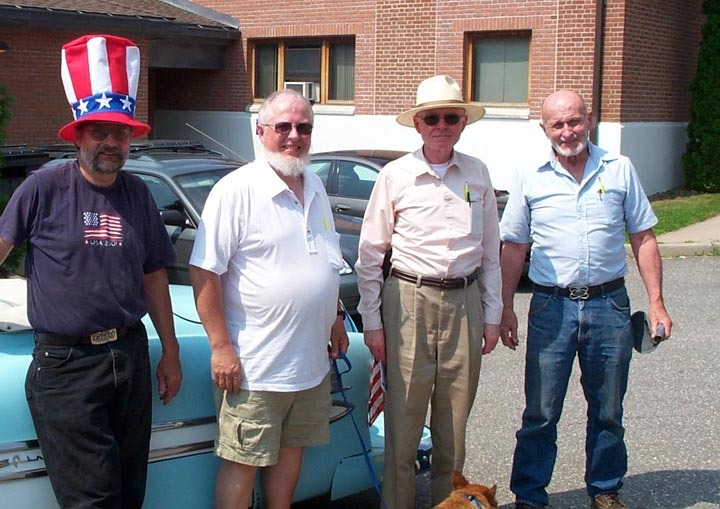 The blue car behind them carries Historical Society president Fred Warner with special guests and old friends George Hilton and Bruce Wheeler. Jim Fenn driving some historical wheels, with Fred Warner and special Historical Society guests Bruce Wheeler (in back, behind Fred) and George Hilton. Bruce's father (who died in 1977) and George put a lot of effort into producing the Barkhamsted Heritage which was published in 1976. We are glad they did. 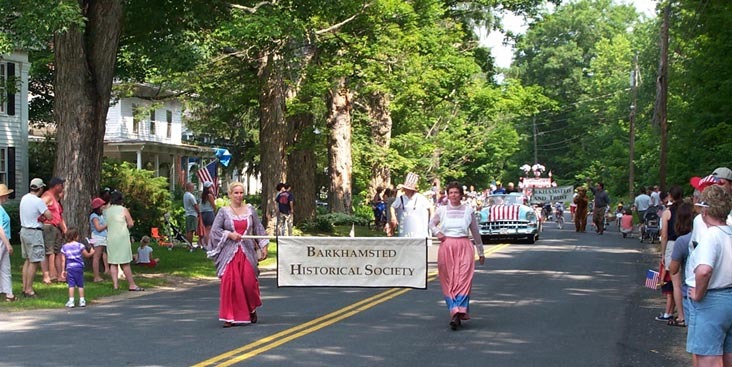 A walking version of the Barkhamsted Heritage ahead of the Historical Society vehicle on West River Road. bridge just before the start of the parade. Looks like a nice cool spot. The famous Star Band and a portion of the crowd gathering for the ceremonies at the Barkhamsted Elementary School after the parade. 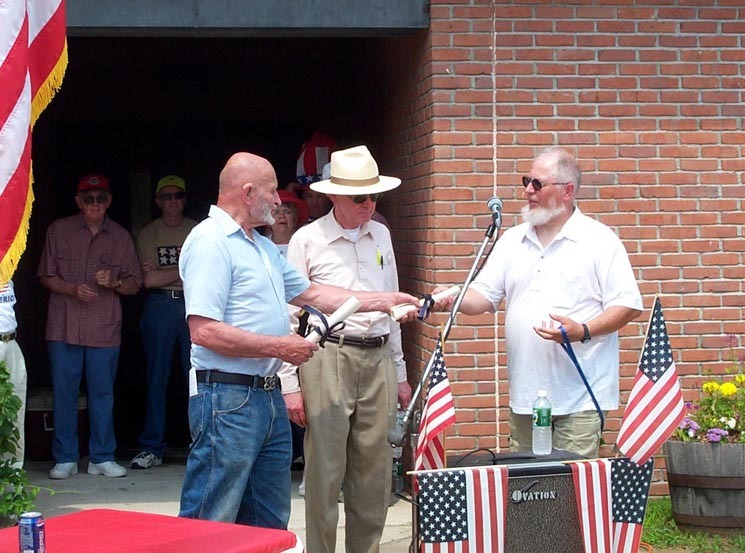 Above- During the ceremony after parade, Fred Warner (left), president of the Historical Society, honors George Hilton (center) and Richard Wheeler (represented here by his son, Bruce Wheeler, at right). Hilton and Wheeler were the co-editors of the book "Barkhamsted Heritage" published in 1976 and still a very valuable reference. 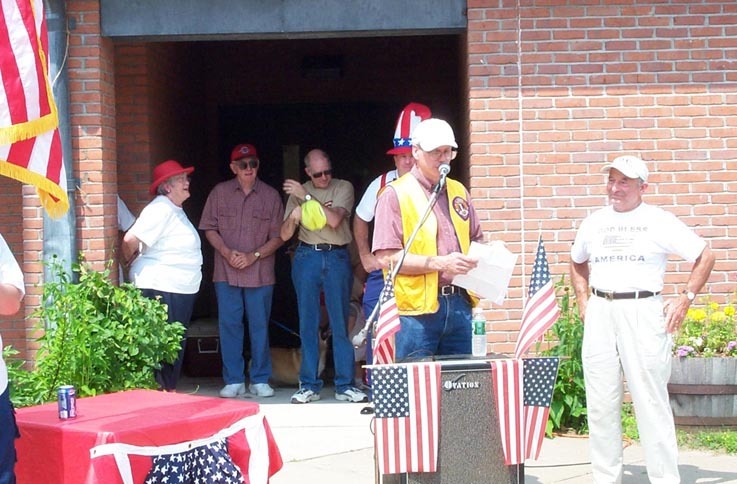 Roger Behrens of the Barkhamsted Lions (the Lions sponsor the parade) honoring the 2003 Parade Marshall Francis Lattizori for his extensive volunteer work over the years. Tavern after the parade. Also shown is Walt Landgraf (far right) and Bruce Wheeler. The Historical Society held an open house at the Tavern at the conclusion of the parade giving visitors a chance to see how work at the Tavern is progressing.